Professor Brook Hailu Beshah joined the E.W. Scripps School of Journalism as an adjunct professor in Winter 2011. He was a practicing diplomat with the senior rank of minister plenipotentiary and was the deputy permanent representative of Ethiopia to the UN and the deputy ambassador to the U.S. He played a key role in the multifaceted bilateral relations between the Ethiopian and U.S. governments. 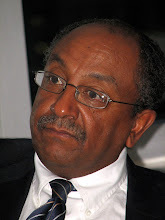 He also oversaw public diplomacy activities in reaching out to the American public; the Ethiopian Diaspora; U.S.-based NGOs, think tanks, religious and humanitarian organizations. He is a well known personality and sought-after expert analyst and resource person, for instance by the Council of Foreign Relations. He is occasionally interviewed by international TV and radio stations and the press, such as the BBC, VOA in African and Middle Eastern regional security; African media; peace and conflict in Africa; democracy and governance and culture. Professor Brook Beshah has major appearances on the BBC TV International and VOA. Professor Beshah writes occasional op-ed’s in publications including the Wall Street Journal. Professor Beshah has lectured at different US, European and African universities. Besides the Scripps School of Journalism, he is an adjunct professor at the School of Public Policy, Heinz College Carnegie Mellon University. He was also an adjunct professor at the Elliott School of International Affairs, George Washington University; at the University of Maryland; The Washington Center; at the Northern Virginia Community College; Leipzig University in Germany. Minister Beshah’s academic career goes back to 1980 where he was a full time faculty at the Department of Political Science and International Relations of Addis Ababa University, Ethiopia. He lectured in international relations, political science and media courses. He had served distinguishably as Head of the External Relations Office of Addis Ababa University promoting academic and research collaborations with US, European and African universities, various research institutions and supervising international student exchange programs. Beshah earned his Ph.D in international political communication) from Leipzig University, Germany, which has a tie with the Scripps School dating back to the early 1990s. He earned a certificate from Ohio University for a summer study program in 1993, and M.A. from Leipzig University in political science and international relations; and his B.A. from Addis Ababa University in political science and international relations. He has participated in numerous national, regional and international conferences, workshops, seminars, technical meetings and training programs in Africa, Europe and the U.S. and was also a visiting scholar at Ohio University. He has widely traveled and speaks English, German and French.